The children of the fishing families never had an easy life. Life in the nineteenth century and early tweentieth century was characterized by poverty. Children often went around without any shoes on their feet. They had many brothers and sisters yet they all slept together in the one bed - tip to toe. They never had any pocket money - indeed they did not even understand the concept of pocket money. Their mums and dads worked hard every minute of the day to make sure they got food on the table. There was not much left over for the children in the way of treats. Yet for one month of the year the children of the Old Town in Scarborough lived like kings and queens. They looked forward to the site of the herring fleets. The scotch fisher lasses would appear by train and soon the outer harbour became a scene of the greatest industry and activity. The children used to hide behind crates. Around the corner there were more children hiding behind more crates. They waited and watched the herring boxes. Some would fall out as they were lifted. The children would sit praying for as many to fall out as was possible. They watched them as first they wobbled and then they fell. Then they sprang into action and ran to get the falling fish. 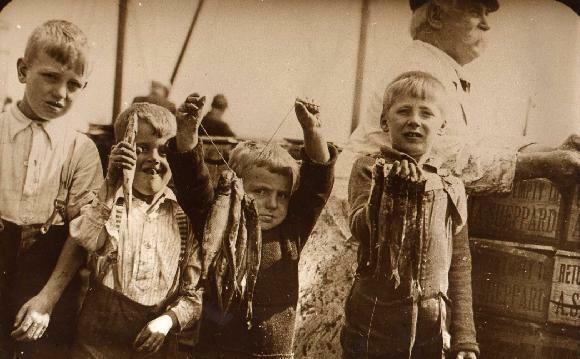 Some of the fishermen used to shout at them and would give them a 'clip' - some of them were real nasty. Other fishermen took it in good humour and expected them to pinch the odd fish. Generally the kids were too quick and too agile and got away with their prize. Anyway the fishermen were too busy with the many tons of fish that needed processing. There was plenty for all. Then they would take the herrings and walk around the estates selling them for pennies. They used to trek out to Barrowcliff on the old railway line or to Edgehill. They used to go to the old peoples dwellings (they were called dwelling rather than flats back then). Then came the best bit as the children came to spend their ill gotten gains. They sat together on the castle dykes eating their goodies. They had riches they could never have dreamt of. There was one man who even used to join in the great bonanza. He had he barrow down by the harbour and sent his grandchildren down to pinch fish. They got loads and filled his barrow. He used to go round the Old Town selling the fish in the same way the children did. Sometimes the children fought for the fish. They would join together as a gang. They would fight each other - slapping each other round the face with the herring prize. At the end of the day they stank of fish but didn't care. Then one day the scotch fisher lasses would pack up and move onto the next port as the boats followed the herring shoals down the coast. Then all they could do would be to dream of the next year.